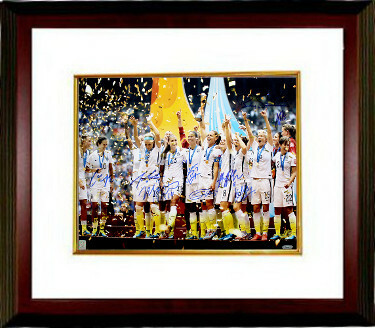 This is a 2015 World Cup Champions 16x20 photo personally hand signed by Carli Lloyd, Morgan Brian, Shannon Boxx, Alyssa Naeher, Kelley O'Hara, Christine Rampone, Amy Rodriguez, Becky Sauerbrunn and Julie Johnston. Custom White Mat and Premium Mahogany Frame as shown. Tri-Star Hologram and Certificate of Authenticity from Athlon Sports Collectibles. This product was added to our catalog on Tuesday 04 December, 2018.